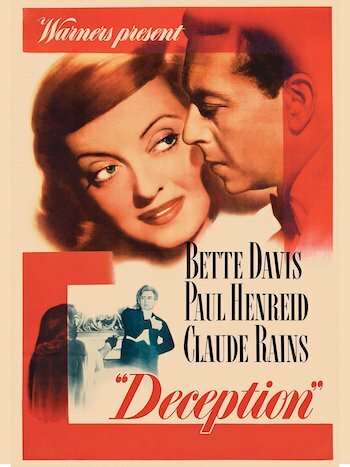 Deception teaches us the hard way that the only thing worse than a film ending with a big cello concerto is a film that drones on with lots of talk ten minutes after the big cello concerto. Watching Paul Henreid straddling a big violin as he makes all these “either I’m a musical genius or I’m in need of some serious fiber” faces while he plays some obnoxious dirge that composer/rival Claude Rains dreamed up in between bouts of surly self-pity at having lost the affections of Bette Davis, made me realize why you don’t see a lot of love triangle movies involving classical musicians these days. 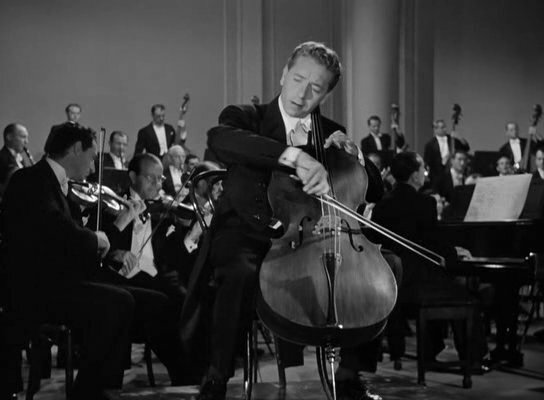 Henreid (Casablanca) plays Karel Novak, the European cellist with all the talent, but with a bit of a sour outlook on life after surviving the war in Europe. 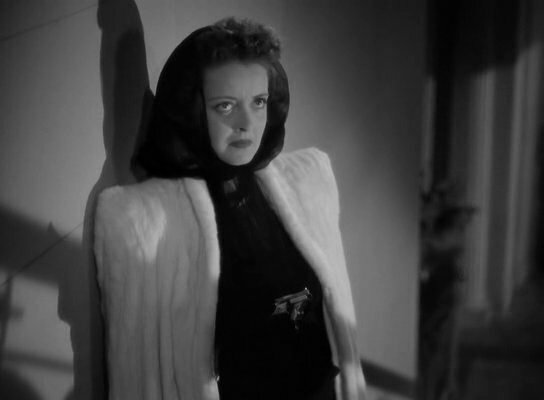 Bette Davis plays Christine Radcliffe, a musician who was in love with Karel up until she lost track of him during the war and presumed that he had perished, making it necessary for her to take on world famous composer Alexander Hollenius (Rains) as her sugar daddy. Despite his post traumatic stress disorder, Karel handles all of this pretty well, resorting to trying to choke the life out of Chrissy only once. Clearly, they’re ready to pick up their dysfunctional relationship right where the left off before that pesky war so rudely interrupted things. In fact, it’s only a few days after Chrissy discovers Karel playing at a little concert for some college punks that they get married. It was a beautiful ceremony, complete with lots of musician friends, a jazzy version of “Here Comes the Bride” and the surprise guest appearance by jilted ex-boyfriend Alexander. Alex has just come back from California following a phone call by Chrissy wherein she casually lets him know that she’s getting married to someone else. Alex blusters his way into the wedding reception, unleashes a barrage of contumelious remarks, orders Chrissy around like a maid, and pretty much ruins the evening for everyone. Normal folks would try to steer clear of the psycho ex-boyfriend if at all possible, but musicians aren’t normal folks, so it seems as if every ten or fifteen minutes either Karel or Chrissy find some excuse to traipse over to Alex’s mansion for any variety of confrontations. Chrissy goes over there to find out if Alex is going to spill the beans about their relationship. Karel goes over there looking for Chrissy and ends up agreeing to play a cello concerto that Alex just wrote. Chrissy storms over there to demand to know what’s up with this cello concerto and to see if it’s all just a way to sabotage Karel’s career. Then Chrissy goes back over there again to see if he’s going to tattle tale on her after the big concerto is done. Why don’t these three freaks just move in together? The movie presumably takes it’s title from Chrissy deceiving Karel about the nature of her relationship with Alex though this was a little lie that never needed to be. Why didn’t she just own up that she was seeing Alex, break it off with him, marry Karel and avoid Alex at all costs? If she had been up front with Karel, that would’ve taken a bunch of the steam out of Alex as far as the constant carping about what a piece of crap Chrissy was. And if Chrissy was afraid to tell Karel because she was afraid of his jealously, then she’s too much of a spineless ninny for us to care about anyway. The build up to the big concerto is as deadly dull as the concerto itself and includes a scene where the three of them are having dinner (I thought they all hated each other. What are they doing having dinner together before the big concerto?) that goes on so long that I wanted to reach through my TV set and slap Alex across the face and tell him to just shut up. What is wrong with Chrissy and Karel that they tolerate this moron? It should come as no surprise to anyone whose ever seen a Bette Davis movie involving a love triangle (see also the much superior The Letter) that Alex ends up tumbling down his big staircase with a bullet in him. 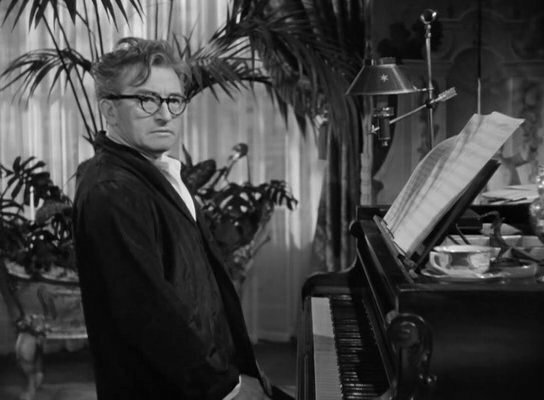 The only thing the movie really delivers on is Claude Rains’s bad hair. Fans of that thing on his head (it did a good job in The Invisible Man as well as in Kings Row) definitely owe it to themselves to check this movie out as it gets a lot of good screen time and assumes a variety of funny looking poses. Deception as a whole though is painfully larghissimo.